There is an SL list of the nine standard enclosures. It uses an enclosure notation, which is unpopular from the point of view of discursive discussion (just as Linnaean names in biology are conversation-stoppers). See discussion now being moved to enclosure nomenclature. 3554 enclosure, which has a long history. Almost all unusual enclosures are centrally-oriented, because they are weak in the corner. The enclosures based on 4-4 points are influence-oriented, except the 4463 enclosure for which the 3-3 invasion lives only in ko (normally). 4442 and 4452, not supported by other stones, are very special techniques. 3564 enclosure (see Strange Opening From A Pro Game). 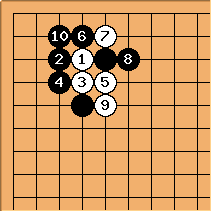 The 3445 and 3446 enclosures are typical special techniques in the Chinese fuseki and mini-chinese, for positions in which 3454 wouldn't be ambitious enough. 3373 is a rare formation. 3374 is perhaps mid-way between an enclosure and an extension. It has been played by Seo Pong-su. 3464 is an O Meien experiment. 3465 was played by Suzuki Etsuo. 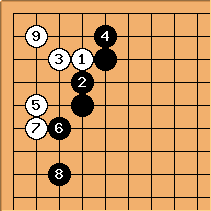 The 3473 enclosure is actually a move with a long history - Dosaku played it - normally played for reasons of fighting or balance on the side. O Meien has tried it. Kato Masao has played 3474. 3483, played free-standing rather than in a kind of Chinese formation, is in fashion in 2002 with Yang Yi and Wang Lei Sr..
Yi Ch'ang-ho has tried the 3553 enclosure more than once. The 3563 enclosure has been played by O Meien and also played by Zhou Heyang. Recently O Meien has used the 3564 enclosure many times. The 3583 enclosure was tried by Kamimura Kunio. The Chinese enclosure 3493 has of course been given a great deal of attention in relation with the Chinese fuseki and its variants. 3584 has been played in recent times by Otake Hideo. 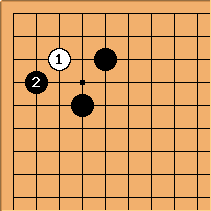 3594 was played in 1973 by Hashimoto Shoji. The 35103 enclosure, if you could call it that, is quite common, relatively speaking; as is the 3593 enclosure. Discussion of the 35113 enclosure at 3-5 point distant low approach. Yang Keon has played 3663. The nineteenth century player Takasaki Tainosuke experimented with 3683 and 4674. Ma Xiaochun has played 4475 more than once. Kamimura Kunio once played 4565. 4554 was an experiment of Yu Bin. 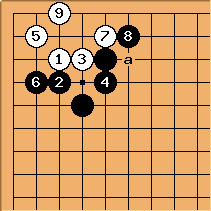 4573 was played by Ishida Yoshio in the Nihon Ki-in Championship match 1971. The 45103 enclosure had an outing in eighteenth century go. 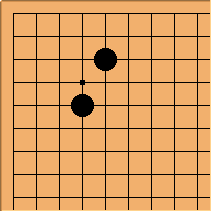 Sometimes a player stakes out a bigger corner with an irregular shimari. How do you handle it?. Black gets influence and white can live in the corner comfortably. 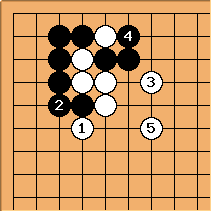 Now black has territory in the corner and white some influence in the center. Bill: How does White handle this hane? White lives on smaller scale. On the other hand there is a cutting point at a.
MDH Here is a different one that I played against recently. 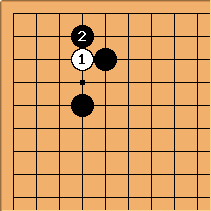 White ended with seki in the corner. 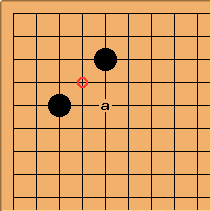 Bob McGuigan: Yi Chang Ho has played this pattern. There are a few games on GoBase. It seems White doesn't invade the corner immediately, but waits to see how things develop on the left and top sides. A common followup play for Black is at a. Even after this there is still aji for a White play at the star point. Charles See 3553 enclosure: normally White plays at the circle point.